The career of C. S. Lewis as a Christian apologist cannot be easily distinguished from his career as a writer. With the exception of two collections of poetry that would have been forgotten if not for Lewis’s later success, his career as a writer began with his conversion to Christianity and every one of his works, fiction or nonfiction has some degree of apologetics in it. The Pilgrim’s Regress is the first book Lewis wrote after his conversion and is his first book in prose. It was not a success, but it turned out to be a precursor of greater things to come. The Pilgrim’s Regress is early Lewis and is therefore somewhat rougher than his later books. It is meant to be an allegorical and semi-autobiographical account of Lewis’s rejection of Christianity in his youth, his dalliances in Atheism and various fashionable ideologies of the early twentieth century, and his eventual return to Christianity. The title, Pilgrim’s Regress is meant to evoke John Bunyan’s Pilgrim’s Progress. Like the earlier and more famous work, The Pilgrim’s Regress describes a spiritual journey. I do not think it is as accessible as that earlier work. Bunyan was a self-educated tinker and his journey was perhaps closer to that faced by the ordinary Christian. Lewis, by contrast, was a very well-educated Oxford professor and his journey was more intellectual than most. Lewis was still young, both in age and as a Christian and he couldn’t resist the temptation to show off his erudition. These factors made his allegory more obscure than it should have been. Lewis also shows a certain impatience and even anger in this earliest book. Fortunately, in his later works, Lewis learned to be more humble and understanding of others’ faults. The plot centers on the journeys of John, an everyman character. John is disillusioned by the hypocritical worship of the Landlord by the Stewards, represented by their putting on masks, and has a vision of an island that he desperately wishes to go to. John leaves his homeland of Puritania and stops believing in the Landlord. He never forgets the island, even though many of the people he encounters believe it to be imaginary. In his quest for the island, John meets such characters as the Clevers, Media Halfways, Mr. Sensible, Reason, the giant Zeitgeist, and many others. He finds his way blocked by the Grand Canyon, which can only be crossed with the help of Mother Kirk. John and his companion Vertue try to go around the canyon, but cannot. Eventually John submits to Mother Kirk, representing the Church, and learns that the object of his longing is the country that he has left. He is taken back to his home, but freed from the deceits of the false philosophies he has earlier followed; he sees the path as it truly is. I am not sure that I can recommend this book to anyone not already familiar with C.S. Lewis. The casual reader and even a Lewis fan may find the references to early twentieth century intellectual movements hard to follow and the book somewhat unsatisfying. For someone more familiar with Lewis, it is interesting to see some of the themes of his later books appear here in an early form. The island represents the feelings of joy and longing which led Lewis to return to Christianity and which he refers to in many of his writings. His belief that the pagan myths foreshadow the Gospel is another theme that appears in the Pilgrim’s Regress. 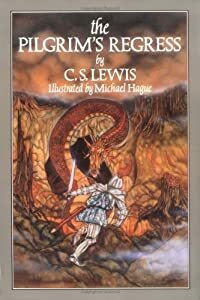 Overall, I would say that the Lewis fan should read The Pilgrim’s Regress to gain a better understanding of Lewis, but it shouldn’t be the first book by C. S. Lewis one should read. This entry was posted on October 29, 2013 at 6:36 pm and is filed under Books I've Read, Christianity, Favorite Things, Religion. You can follow any responses to this entry through the RSS 2.0 feed. You can leave a response, or trackback from your own site. I’m glad this post has just been drawn to my attention – not least for the stimulus to further thought (thought that might never have occurred to me, otherwise)! Reading of “poetry that would have been forgotten” it’s intriguing to think that he might have only been including in lists of minor poets of the Great War. And to think that the long work on what eventually became The Allegory of Love began before his – ‘regress’? – to Christianity: but how different might that have been without it? Your fine attention to the contrasts with Bunyan has really set me wondering – how much (satirical) humor is there in Pilgrim’s Progress? – and other allegories (and, which)? Are we in part seeing the love Lewis had for Spenser’s Faerie Queene in the ways it’s not as accessible as Bunyan? Is it even something like a Spenserian style applied to a Bunyan story line? Anyway, thanks a lot for this!